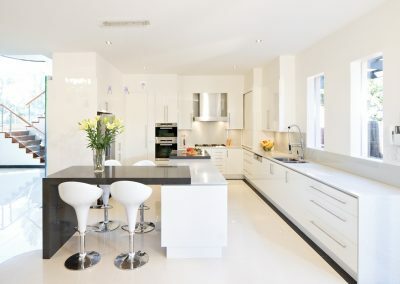 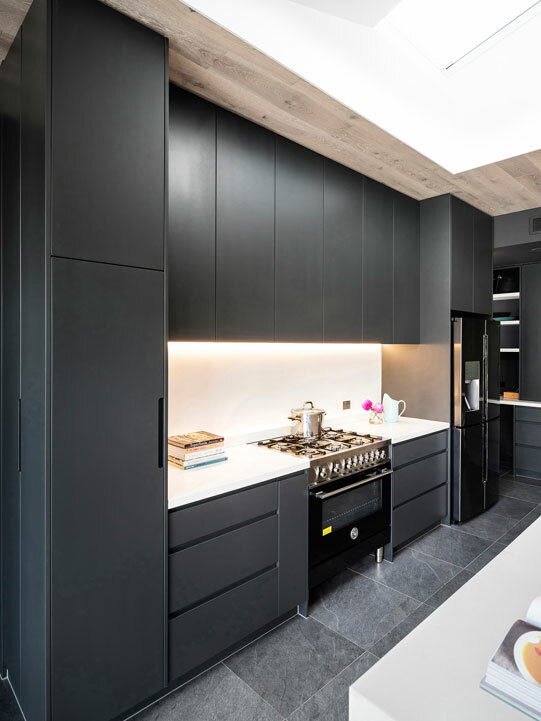 Showcasing clean lines and a boldly contrasting colour palette, this contemporary kitchen was expertly designed by Beth Paron from Smith & Smith Kitchens. 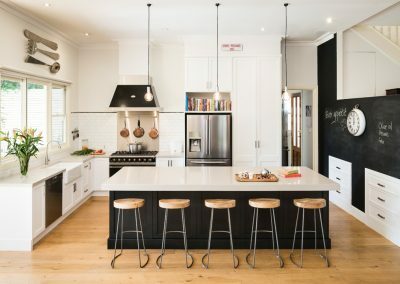 The decision to use textured off-black paint on the cabinetry doors creates a calming environment, while the stark white elements add brightness and definition. 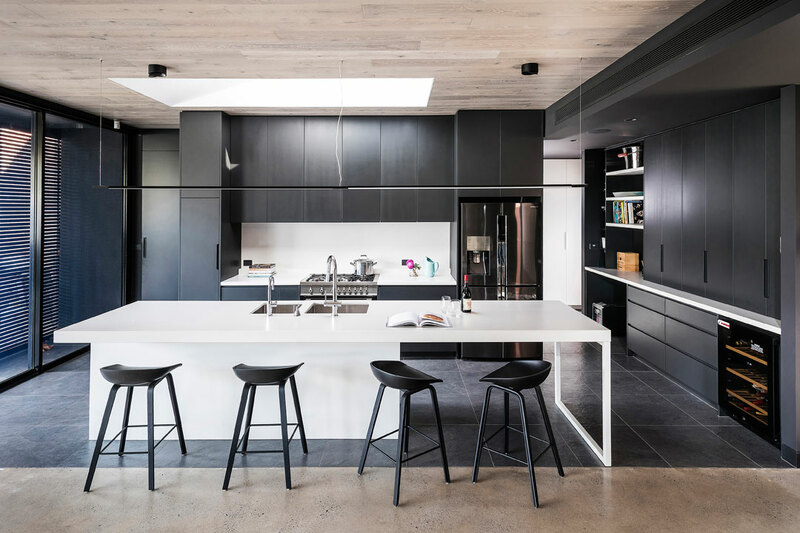 Created as part of a whole-home project by Venn Architects, the 4.2m x 3.3m space flows into the open-plan living area, which features a visually cohesive entertainment unit. 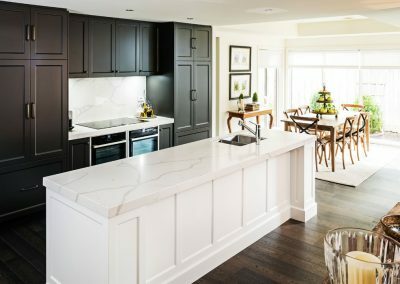 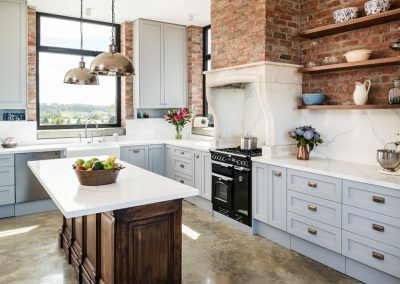 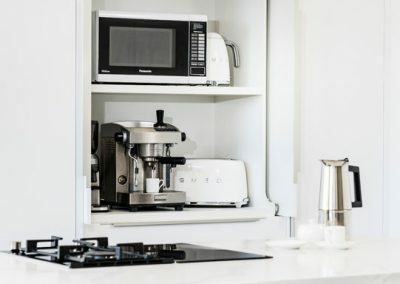 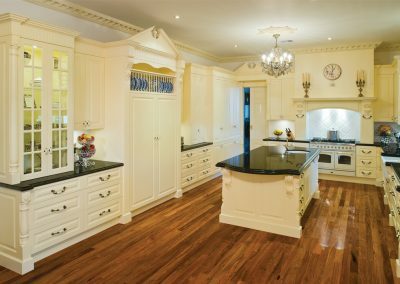 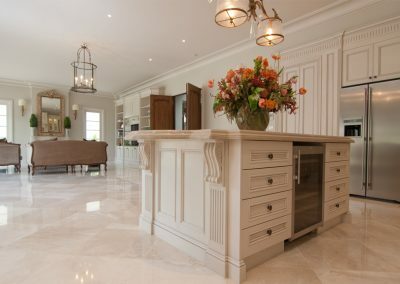 Smith & Smith Kitchens also installed a workstation next to the kitchen to encourage the family to enjoy more time together throughout the week. 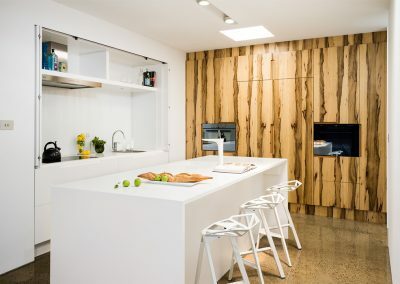 Seamlessly connecting the two spaces, the cantilevered island bench has an extended breakfast bar that provides the perfect place to enjoy casual meals. 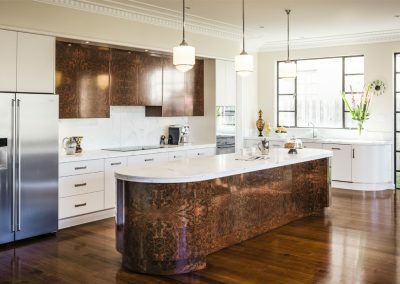 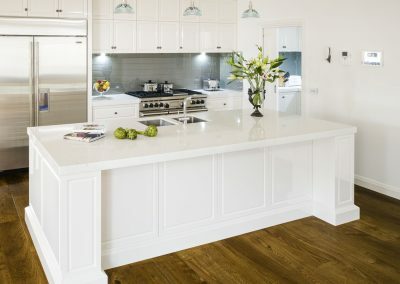 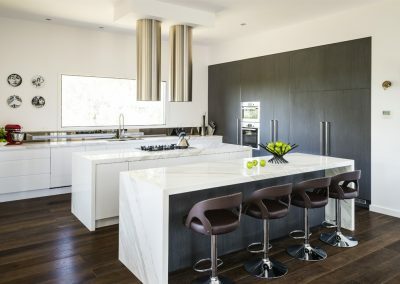 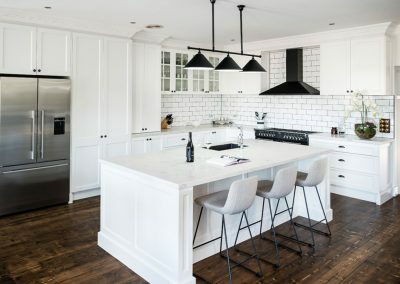 The island’s base features a bright Dulux ‘Colorbond Surfmist’ finish, while its luxurious Caesarstone ‘Pure White’ top beautifully reflects sunlight from the overhead skylight. 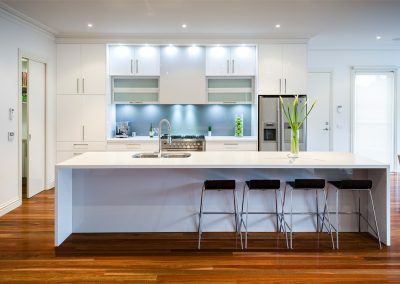 Providing increased illumination to all workspaces, LED strip lighting is strategically positioned above all of the benchtops. 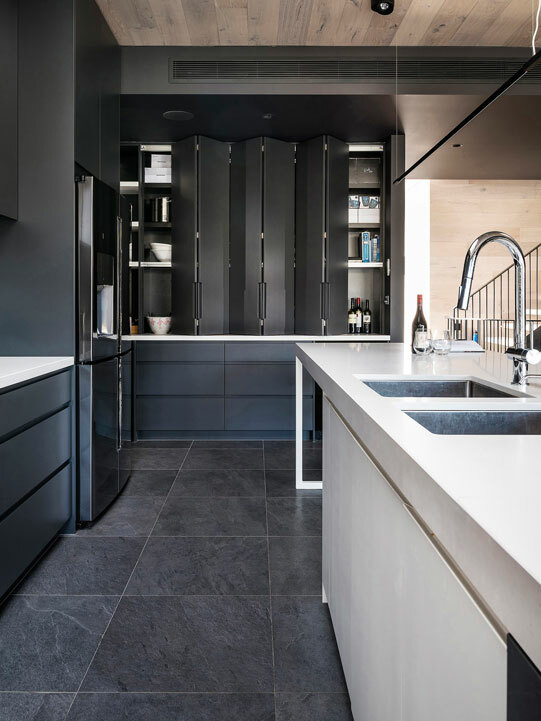 Hidden behind black bi-fold doors, an appliance cabinet with matching black-laminate open shelves provides a great place for the homeowners to display and store their large or decorative items. 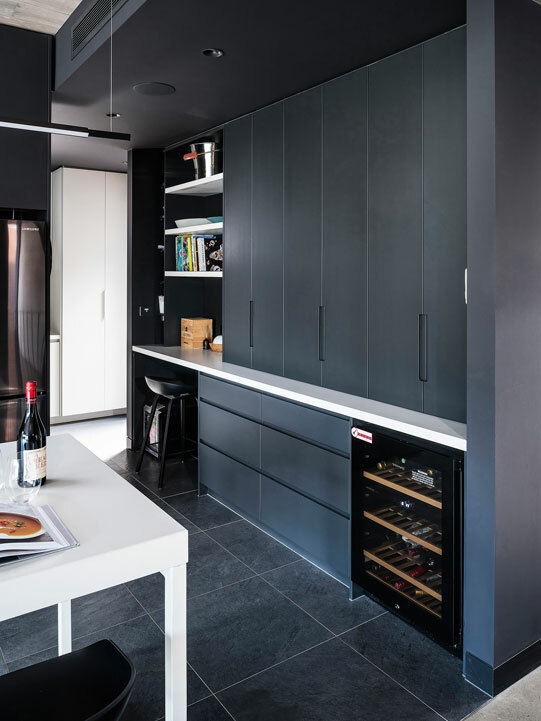 To suit their social lifestyle, a beverage fridge was partially integrated underneath the cabinetry. 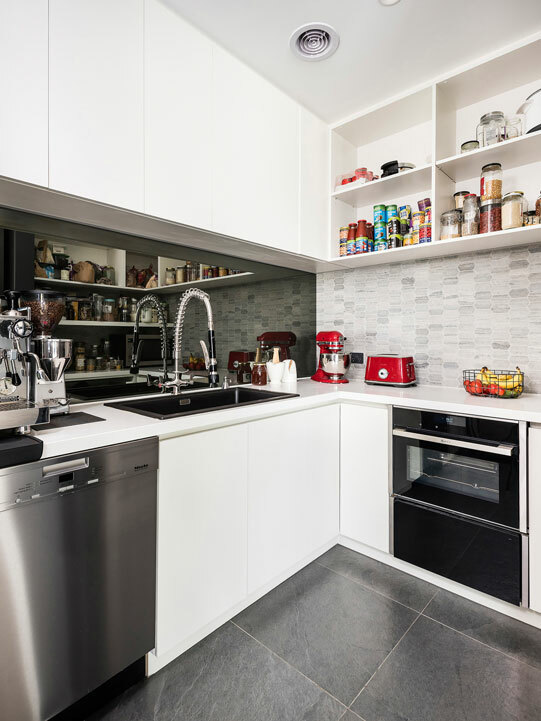 Designed to accomodate the homeowners’ love for cooking, the highly functional kitchen is fitted with a semi-integrated fridge and an efficient oven and cooktop. 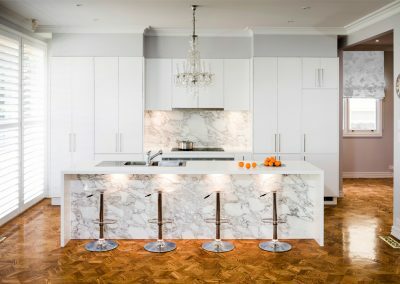 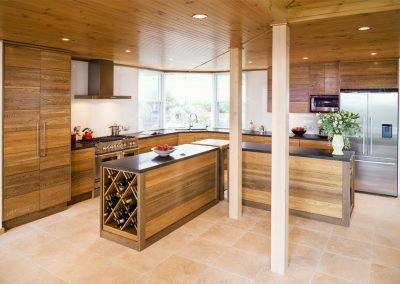 Smith & Smith Kitchens incorporated a tall custom-made cabinet with shallow shelves beside the cooking area to provide convenient access to spices and oils. 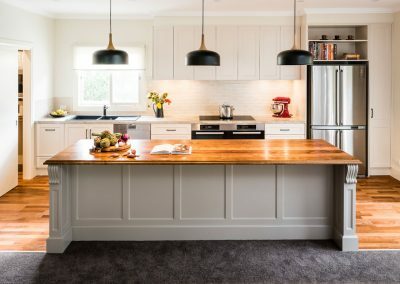 Featuring an additional fridge and oven, the 3.6m x 2.23m butler’s pantry offers plenty of bench space, as well as a dishwasher and a large sink for an easy clean-up. 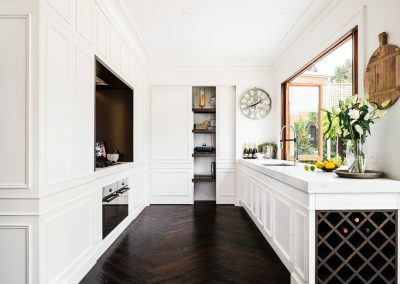 The butler’s pantry features a combined tile and black-glass splashback, while its bright white cabinetry matches the new laundry, which was also completed by Smith & Smith Kitchens.